So after months of speculation, including some of my own, the most highly anticipated Photokina announcement came out on Wednesday. The Canon 5D Mark II is here, boasting a 1Ds Mark III equalling 21 megapixels in what Canon are calling their most advanced sensor yet, and shooting up to 30 minutes of HD video to boot. If I had phoned up Canon and asked for my perfect camera, this is pretty much it. The killer improvements for me are the combination of high resolution in a small, weather sealed body. Travelling with 2 1Ds mark II bodies is a hassle, and their height means they don’t fit easily into some camera bags, including my Lowepro Pro Roller. 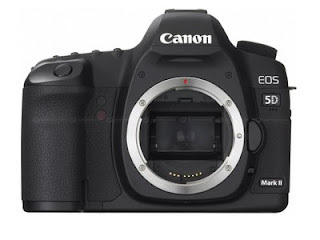 A pair of 5D Mark IIs will be significantly lighter and less bulky, along with smaller batteries and chargers. I haven’t been using the current 5D because I was not prepared to give up the higher resolution and weather sealing of the 1Ds. Now I don’t have to. It will also be nice to have the additional features of the latest generation of cameras such as 14-bit colour, 3-inch screen and automated sensor cleaning. A friend of mine was surprised it only had 9 AF points. But that seems plenty to me. My 1Ds has 45 focus points, but I use a custom function to reduce it to 11 as otherwise it takes too long to select the one I want. And finally there is the ability to shoot video. I’ve never shot video in my life before, and I’m sure I won’t be using it professionally – at least in the medium term. But I’ll certainly play around with it and it may well prove to be ideal for grabbing some behind the scenes footage from my shoots to post on the blog. So it will finally be time to say goodbye to the trusty 1Ds IIs.